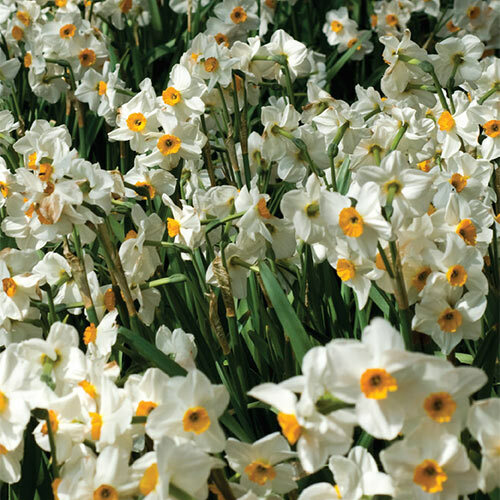 When your customers are looking for an easy-care bloom to jazz up a late-season garden space, consider recommending our Geranium Daffodil. A lovely multi-flowering tazetta type, this fabulously fragrant variety bears up to 7 delicate-looking blooms per stem. It creates a flurry of flowers in sunlit borders, decorative containers and cutting gardens. Customers will love how just one stem makes a lush bouquet filled with color and a sweet aroma. Geranium Daffodil boasts very showy, snowy white flowers accented with vivid orange cups, and is one of the latest-blooming of its kind. A wonderful naturalizer, it reappears yearly with increased vigor and bloom.